The Fellowship was fortunate enough to obtain a copy of WEIRD LOVE #11 from Yoe Books and IDW Publishing. No credits are listed for the writers except for “The Prayer” by Joe Gill. The art is by Odgen Whitney, the Iger Shop, Henry C. Kiefer, Bill Fox, George Klein, Ralph Owen, Charles Nicholas, and Jon D’Agostino. “Jailbird’s Romance”: Angela Morelli’s life on the streets has turned her to a hardened criminal who falls in love with a rich man’s nephew. Can she find true happiness, or will her past prevent that from happening? “Happiness is a Guy Named Joe”: Joe and Elaine want to get married, but her parents feel they are too young. They run away, but are caught and returned home. Will our lovebirds ever find happiness? “Hobo Girl”: Dacia is a popular model and engaged to an advertising man, but living beyond her means. The stress starts to affect her physically and must leave this life. She eventually gets a job picking crops, but she may find something else….romance. “The Prayer”: Norma and Bill are happy newlyweds. But will the marriage survive his distaste for her cooking? Another great group of weird, insane, but overall enjoyable romance stories! Glad Yoe Books and IDW Publishing are keeping these (and other old school comics) alive for today’s audience to read. If you haven’t checked out this title, you won’t be disappointed. 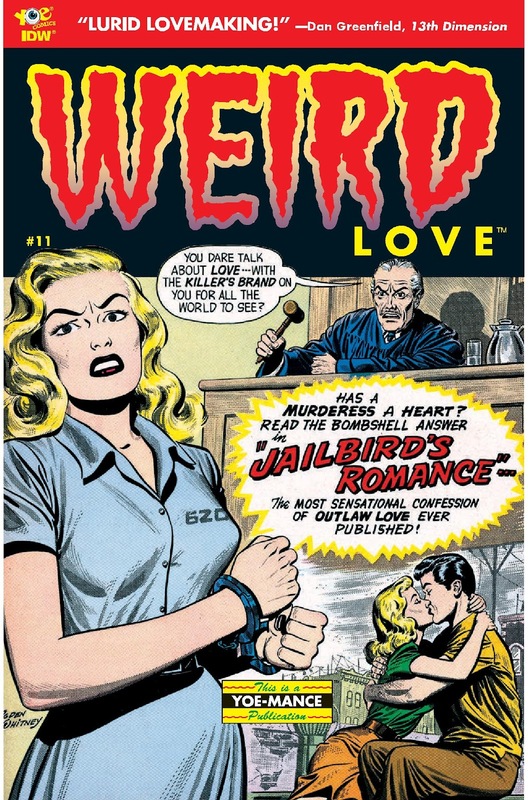 WEIRD LOVE #11 is in stores now, or available for ordering at www.idwpublishing.com.